OTJ Architects is a well-respected national architecture and interior architecture design firm that has successfully completed thousands of projects throughout the country. Founded in 1990, OTJ is comprised of five studios headquartered in Washington, DC, with more than 60 architects and designers, many of whom are LEED Accredited Professionals. The responsive architecture and interior architecture consultants create effective environments through listening, understanding and tailored design. Location: Nationwide - OTJ is registered in 37 states and is able to consult in all 50 states. 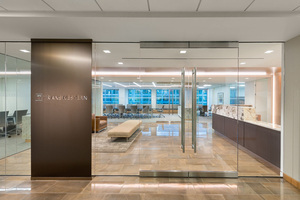 The Raben Group – Washington D.C.
Booz Allen Hamilton’s Innovation Center Offices – Washington D.C.
OTJ Architects’ Offices – Washington D.C.